It's been a rough week of cleaning house and dealing with a very angry teething baby. I started the morning by attempting to hit an estate sale (which was canceled) and a church sale (which had the wrong hours listed onlinet). Instead, Amanda, Livie and I cruised around Big Lots for cheap lipstick and hit the sales at the mall. I got some new bottles for Olivia and a lipstick for me. Anyways, on with the show.....tonight's Fashion and Film Friday is one of my all-time favorites, Indiana Jones and the Last Crusade. I don't know about you, but I am totally madly in love with the Indiana Jones movies. Much like Star Wars, the last is my favorite. I told Pj that if we ever have a boy, I think it would be awesome to name him Indy. He said, "We'll name the dog Indiana!" In this installment, we find Indy scouring the globe in search of the men who kidnapped his father, a historian who may have discovered the location of the Holy Grail. With his father's diary in hand, he meets up with Dr. Elsa Schnieder, a knock-out blonde femme fatale who climbs through catacombs, caves and sides with the Nazis to get what she wants. 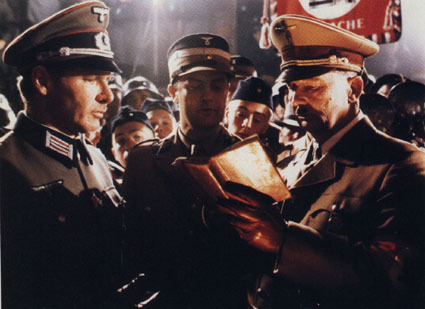 Indy battles the Nazi's, comes face-to-face with Hitler and goes through challenges set by God to try to find the Grail and save his father's life. As far as fashion goes, weather Indy's sporting a dapper suit in his classroom or his classic adventurer garb, he always looks very dashing. This film provides great inspiration for gentlemen when it comes to the fantastic men's tweed suits and hats of the 40's. Even though Elsa Schnieder is one of the only sylish females in thic movie, there is plenty of fashion eye-candy. Of course, girls- we can all take a style hint from the rugged but sophisticated Indiana Jones too. 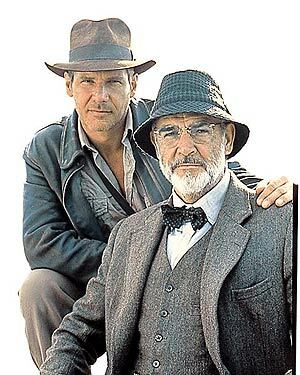 I love the Indiana Jones movies! They were some of my favorite as a youngin. Anything with Harrison Ford is FINE BY ME! Thanks for adding the outfits. They are adorable. Love the black leather gloves in the Elsa Black and White spread. I love this movie! And even when i was little i loves the outfits that Elsa wears through out the movie, so glamorous! love these outfits, I wonder where I can find that utterly adorable olive green sweater! any thoughtas! I so love the Indiana Jones movies except for the "Crystal Skull". Wouldn't it be wonderful if having class came back in style, where gentlemen were such and ladies even dressed up for a romp through the catacombs ? Oh me too! This is also my favourite, although I love them all this has everything!! II think including a Hindenberg airship!!!! So elegant! The actress who plays Elsa was also in the Colin Firth version of the Secret Garden; she was the 'flashback/ghost' of Colin's mother, with a really pretty painting of her featured in the story.